A MAN WEARING a canvas shirt tucked into blue jeans walks through the tall grass, clicks a break-action shotgun, and fires a round. “I approve this message,” he says. The camera zooms in on the target as it explodes in the distance. It is not a TV ad for a Republican, though a similar shotgun did appear in a controversial ad run last fall by Georgia’s recently inaugurated Republican governor Brian Kemp. The scene comes, instead, from a spot for the senior Democratic senator from West Virginia, Joe Manchin, who was reelected in November. The target he shoots displays a sign saying “lawsuit on coverage of pre-existing conditions,” referring to a 2018 case brought against the Affordable Care Act (ACA) by two governors and eighteen state attorneys general, among them Manchin’s Republican opponent, Patrick Morrisey. Before Manchin fires the round, he calls Morrisey “dead wrong.” In this genius—and electorally effective—feat of political messaging, Manchin packages a liberal policy idea in a conservative cultural form. “Rural spaces,” writes Elizabeth Catte, author of What You Are Getting Wrong About Appalachia, “are often thought of as places absent of things, from people of color to modern amenities to radical politics. 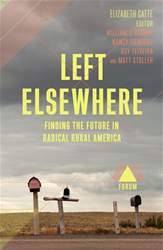 The truth, as usual, is more complicated.” With activists, historians, and political scientists as guides, Left Elsewhere explores the radical politics of rural America—its past, its priorities, and its moral commitments—that mainstream progressives overlook. This volume shows how these communities are fighting, and winning, some of the left’s biggest battles. From novel health care initiatives in the face of the opioid crisis to living wages for teachers, these struggles do not fall neatly into the “puny language,” as Rev. William Barber says, of Democrat or Republican. Instead they help us rethink the rural–urban opposition at the heart of U.S. politics. The future of the left, this collection argues, could be found elsewhere. With contributions from William J. Barber II, Lesly-Marie Buer, Elizabeth Catte, Ash-Lee Woodard Henderson, Nancy Isenberg, Elaine C. Kamarck, Michael Kazin, Toussaint Losier, Robin McDowell, Bob Moser, Hugh Ryan, Matt Stoller, Ruy Teixeira, Makani Themba, and Jessica Wilkerson.